Americans have decidedly negative reactions to the candidates running for the Republican presidential nomination. 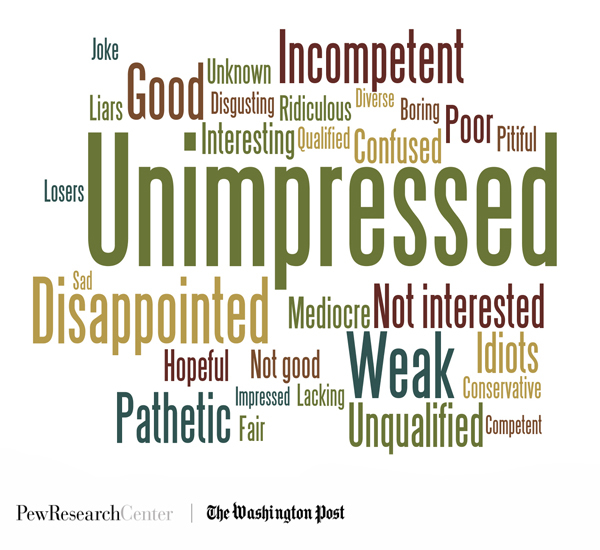 Asked for a single word to describe the GOP field, the top response is a variation on “unimpressed,” with 42 mentions. Overall, 44% offer negative words to describe the Republican candidates, 19% use neutral words and just 12% use positive words. Aside from “unimpressed,” there also are frequent mentions of “disappointed” (21 mentions) and “weak” (also 21 mentions). “Good” is the most frequently offered positive word, with 18 mentions. Still, nearly as many say “incompetent” (17) or “pathetic” (16). These are actual mentions – not percentages – in a survey conducted May 26-29 among 1,000 adults by the Pew Research Center for the People & the Press and The Washington Post. Even Republicans and Republican- leaning independents use mostly negative words to describe their party’s presidential candidates. Nearly four-in-ten (37%) use a negative word, 22% a positive word and 18% a neutral description. 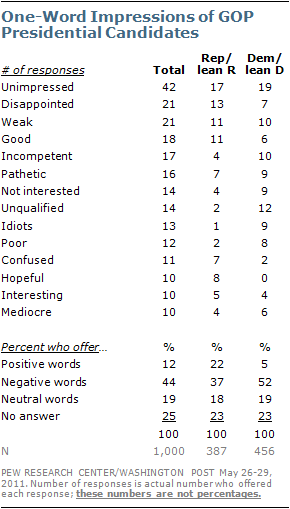 “Unimpressed” is the top descriptor among Republicans and Republican leaners, with 17 mentions.